Widespread body aches and pains are seldom severe, and usually of a deep dull quality. They are felt as a general aching sensation with stiffness in many joints or even throughout the body. Occasionally when a person has done something to aggravate the problem in particular (extra heavy work, greater fatigue, additional stress and tension) the pain can escalate to a burning or stabbing sensation in isolated areas, but usually only temporarily. When the body aches all over the exact symptoms and treatment depends on the underlying cause. Complaints may include widespread aches and tenderness to the touch over these areas, as well as muscle spasms. Whatever caused these generalized aches and pains may bring about specific joint pains, joint stiffness, neck pain, back pain, and difficulty sleeping. Heavy lifting, snow shoveling, or prolonged housecleaning. High heat and humidity of the summer. Rapid alteration of the barometric pressure when a storm front passes through. Unusual emotional stress or worry, as well as depression. These situations that cause a person to hurt all over are usually easy to identify. Correction is as easy and straightforward as being sure to rest, use ice, stretch and massage where it hurts, and take NSAIDs as needed. In these cases, the aches and pains tend to start during or just after the activity, and involve specific areas that were abused. Warm up before exercising and cool down afterward. Drink lots of fluids before, during, and after exercise. If you work in the same position most of the day (like sitting at a computer), stretch at least every hour. However, there are other reasons why widespread body ache arises as a symptom of a potentially more serious condition. Whole body aches that appear without a good reason – you wake up one more and feel like you were hit by a truck – can be a sign that the body is dealing with a body-wide or systemic health problem. When the discomfort appears to be not related to physical causes, it can be due to a widespread immune response to an infection or major health problem. These larger problems need to be addressed first since they can be the primary cause of general body aches in order for the discomfort and pain to stop. Dermatomyositis – possibly due to viral infection of muscles or weak immune system that allows multiple sites of infection to arise, giving pain throughout the body, along with a reddish-purple rash. ACE inhibitors to lower blood pressure – known for serious side effects that may require medical attention: chills, breathing difficulties, headaches, pain in the abdomen, pain in the chest, etc. 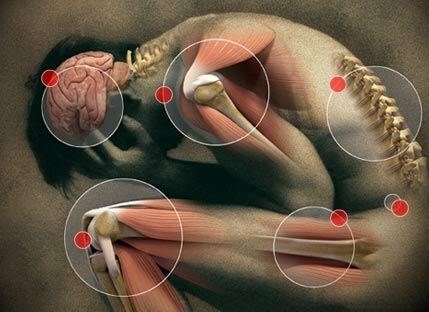 Fibromyalgia – condition of unknown cause that includes tenderness in the joints and muscles and surrounding soft tissue, sleep difficulties, fatigue, and headaches. Lupus (SLE) – pain and stiffness are primary symptoms of lupus, affecting widespread area: hands, wrists, feet, ankles, shoulders, knees and chest, often causing cartilage destruction and permanent deformity. Polymyalgia rheumatica (PMR) – an inflammatory disease of unknown origin causes stiffness and pain in muscles of the neck, shoulders, back and hips, appearing almost overnight in many cases with no relief, often disappearing suddenly on its own in a year or two. Rhabdomyolysis – is a condition in which skeletal muscles break down quickly after massive injury (crush injury, being hit by lightening, severe burns, weight lifting) and spill their contents into the blood stream, possibly resulting in kidney failure and a variety of other serious medical consequences and complications. After muscle overuse or injury rest the affected body part, take a NSAID of choice (aspirin, ibuprofen or acetaminophen) and apply ice for the first 24-72 hours to reduce pain and inflammation. After the acute pain subsides and movement is less painful, apply moist heat to the area of complaint. A good way to diffuse general body pains that are more chronic and recurring in nature is to take a long hot bath in water in which a few cups of Epsom salts have been added. If you suspect your body and pains are due to stress, do your best to get plenty of sleep and try to reduce or eliminate the cause of your stress. Meditation, deep breathing, yoga and simple daydreaming are excellent methods to unwind and sleep better. 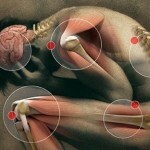 Aches and pains can also be felt throughout the body as a result of depression. Depression is the feeling of overwhelming sadness or loss of interest in things around you that were once important. . Extreme fatigue and loss of energy. Familiar situations that suddenly feel hopeless and overwhelming. Feeling isolated, alone and misunderstood. Whole body aches and feeling too weak and overwhelmed try to move. Depression is common between the ages of 15-30, and much more common in women. Medications can be used to artificially raise the chemical levels of particular neurotransmitters in the brain to help manage these symptoms. If your severe body ache is due to a specific disease you must follow the recommendations and treatment prescribed by your doctor to eliminate the cause of the primary illness behind the pain. If home measures are not helping to control the body aches your health care provider may prescribe stronger pain medication or refer you for a series of physical therapy session or even a specialized pain clinic. There are over 90 serious health problems in which a person can experience body aches or generalized pain along with chills or at least sensitivity to cold. Because many of these problems require medical care, the best advice if you have body aches and chills is to promptly go to your family doctor for an evaluation to determine the cause of your complaints. Lung cancer (non small cell). Typically when a person experiences body aches no fever and no other symptoms, the problem is likely due to overwork and physical exhaustion. The treatment is to simply rest, push fluids, get a massage to ease the ache and wait it out. If additional symptoms occur later, such as a cough, nasal or respiratory congestion, chest pain, or shortness of breath, and still no fever occurs then the chances are that a viral flu has developed and no antibiotic or medication will hasten recovery. It would be best to give the body time to recover with rest, fluids, reduced physical exertion, and perhaps a decongestant that would control some of the respiratory complaints. If after 48 hours the condition has not improved, then call your doctor for additional help and an office visit to check into the problem a bit deeper. Muscle and joint ache lasts longer than 72 hours. You experience sudden and severe pain that cannot be explained by your activity. Redness of the skin over the area of pain. Swelling appears at or near the area of pain. Heat appears at or near the area of pain.